was able to pursue my interests. Background . . . . .
Norepinephrine . . . . Rationale . . . . .
CHAPTER VI. GENERAL DISCUSSION . . .
BIOGRAPHICAL SKETCH . . . . .
(CRF) systems has been postulated to be of functional importance in stress. stress-induced decrease in exploratory behavior. reversed the phenylephrine-induced decrease in this behavior. sympatho-adrenal-medullary response, often referred to as the "flight or fight"
responding facilitates adaptive responding in an emergency situation. nonnutritive cellulose pellets were provided (Mason, 1968a, 1968b). release of the gonadal steroids (Selye, 1946) is also observed in stress. monkeys, an initial period of aggression is observed normally (Coe et al., 1982). submissive) were observed to have elevated concentrations of plasma cortisol. decreased concentrations of plasma testosterone (Coe et al., 1982). responses to a stressor and presumably facilitate coping with the stressor. how this responding facilitates adaptation to a stressor are poorly understood. functional significance of these responses is also unknown (Dunn, 1988). the animal to survive periods of prolonged stress (Maickel et al., 1967). Merchenthaler 1984; Moga & Gray, 1985). other neurotransmitters (Smith et al., 1986). similar to that observed for irCRF (Wynn et al., 1984; De Souza et al., 1985). et al., 1984; Chen et al., 1986). regulated by guanine nucleotides and divalent cations (Chen et al., 1986). compensatory changes to perturbations in the functioning of this system. adrenal sympathetic nerve (Kurosawa et al., 1986). from a nonspecific action of the peptide. increase in the aversive nature of the novel environment (Sutton et al., 1982). At the lower dose of 10 ng, CRF increased locomotor activity in this test. stressors (Colbern et al., 1978; Dunn et al., 1979; Krahn et al., 1986). medullary (A2) and lateral tegmental (A1, A5, A7) noradrenergic cell groups. located within the rostral pontine region in the floor of the fourth ventricle. response compared to background firing, increasing the signal to noise ratio. more pronounced when the visual stimulus was in the preferred direction. attention to or surveillance of the external environment (Aston-Jones, 1985). animal orients toward the external environment. an animal, thereby increasing attention to environmental cues. morphine (Arnsten et al., 1981). and naloxone are observed in the absence of changes in locomotor activity. chamber when tested at least 14 days following the lesion. CRF and NE in mediating behavioral responding in stress. and Coleman (Hull, England). All were dissolved in normal saline (0.15 M). saline immediately prior to use. then applied to form a skull cap around the two cannulae and the screw. made by applying Cranioplastic cement around the canulae and screws. background sounds were masked using a white noise generator (70 db). number of rears (both forefeet off the floor). connected via plastic cannula tubing to a 10 gl syringe. Microfuge, and left at room temperature for 2-3 hours prior to HPLC analysis..
(Supercalc 3a) on an Apple lie computer. serotonin (5-HT), and its catabolite: 5-hydroxyindoleacetic acid (5-HIAA). were then assayed using scintillation spectroscopy. single control group, the Dunnett's t-test was used. INDUCED CHANGES IN EXPLORATORY BEHAVIOR. independently of an activation of the pituitary-adrenal axis. might act to elicit its behavioral effects. Laboratories and was dissolved in 0.15 M NaCI containing 0.001 M HCI. following exposure of the animals to 30 min of restraint. solution containing morphine (1.75 mg/kg) and naloxone (0.75 mg/kg) (n=8). room and 10 min later placed in the chamber for observation. naloxone 10 min before placement in the chamber. *Significantly different from saline-controls (P < 0.05, **P < 0.01). ++Significantly different from morphine-treated animals (P < 0.01). naloxone on the number of rears (Fig. 3-1). were placed in the testing chamber for observation. observed in rats tested in the MCC (Arnsten et al., 1985). the chamber 10 min later. *Significantly different from saline-unrestrained mice (P < 0.05). ++Significantly different from saline-restrained mice. (P < 0.01). intervals. Shaded boxes represent animals receiving 30 min restraint stress. *P < 0.05 (Student's t-test). contact was maintained throughout the testing period (data not shown). Effects of CRF in mice. were as described in Chapter 2. 8.2, P < 0.002) in the absence of significant effects on compartment entries (Fig. depression of locomotor activity (data not shown). Effects of CRF and naloxone. the injections, the animals were placed in the testing chamber. contact, the total number of rears and the total number of compartment entries. 15 min prior to testing. Significantly different from saline-controls (P < 0.05, **P < 0.01). naloxone significantly affected the number of rears or compartment entries (Fig. behavioral time course similar to that of controls (data not shown). Effects of CRF in Rats. injection of either saline or 0.75 mg/kg naloxone. different from CRF-saline (P < 0.01). Fig. 3-6. Effect of 75 ng CRF on the mean time per contact in 5-min intervals. from saline-controls (P < 0.025, Student's I-test) . compartment entries, or rears (Table 3-1). The Effects of Restraint and CRF in Hypophysectomized Mice. testing room and immediately placed in the testing chamber and observed. the stimuli (t = -6.16, P < 0.001; Table 3-2) in the hypophysectomized mice. There were no significant effects on the number of compartment entries or rears. or injected with ICV CRF (50 ng). The data are from two separate experiments. Statistical significance was determined using Student's t-test. affect the number of compartment entries or the number of rears. described in Chapter 2. The animals were housed singly following surgery. the antagonist on the mean stimulus-contact time in unrestrained mice. prior to being restrained for 40 min. no significant effect on the total number of rears. testing room, the animals were injected with 6-8 pl of the cold cream into the CA. skull. The cold cream was then injected manually over a 45-60 sec period. an incomplete block of the CA compared to saline-injected controls (group 5). different from IV ventricular CRF + incomplete CA plug (P < 0.01). following exposure to a number of different stressors (Arnsten et al., 1985). 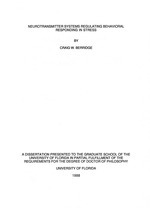 physiological responding in stress (Gold et al., 1984; Koob & Bloom, 1985). the hypothesis that endogenous CRF regulates behavioral responding in stress. induced fighting in rats (Tazi et al., 1987). dose at which CRF stimulates ACTH secretion (Rivier et al., 1984). metabolites are needed to assess how and where CRF exerts its actions. contact times when injected into either the lateral or fourth ventricles. ventricular surface at which these peptides acted to elicit their respective effects. action of exogenous CRF on exploratory behavior is the AV3V region. concentration, Brown (1986) microinjected CRF into various brain areas. injected into the PVN also increased grooming and locomotor activity. the peptide's documented peripheral effects. sexual behavior (Sirinathinghji, 1985, 1987). observed in stress (Stone, 1975; Dunn & Kramarcy, 1984; Glavin, 1985). an indication of the magnitude of these effects. gamma-aminobutyric acid (GABA) concentrations (Jaim-Etcheverry, 1983). decreased in the cerebellum, where NE concentrations were increased. 1977; Skolnick, 1978; Dolphin et al., 1979; Harik et al., 1981). of which are present within 2 weeks after the lesion. exploratory behavior in an open field in DSP-4 treated rats. period required following the use of 6-OHDA. same actions at other receptor subtypes or on other transmitter systems. al., 1977; U'Prichard et al., 1980). mechanism for noninvasively modulating the rate of NE release within the brain. prepared as described in Chapter 2.
were implanted for injection into the lateral ventricles as described in Chapter 2.
immediately placed in the testing chamber. administered ICV. DSP-4 (50 mg/kg) was injected three days prior to testing. saline-controls were excluded from further analysis. group, Dunnett's t-test was used. The effect of clonidine and idazoxan on exploratory behavior. showed stimulus-contact times similar to those treated with the 25 ig/kg dose. any significant effects on the number of rears or compartment entries (Fig. 4-2). idazoxan 10 min prior to testing. *Significantly different from saline-controls (P < 0.05). **Significantly different from saline-unrestrained mice (P < 0.01). 40Significantly different from saline-restrained mice. (P < 0.05). **ting'Significantly different from saline-unrestrained mice (P < 0.01). +Significantly different from saline-restrained mice. (P < 0.05). injected with either saline or clonidine (25 gg/kg) 45 min prior to testing. **P < 0.01). ++Significantly different from saline-restrained mice. (P < 0.01). NAS, HTH, HPC and BST were excised. < 0.05; Duncan's multiple-range test). significantly attenuated this increase in restrained animals (Table 4-1). corticosterone following exposure to the MCC. treated and mice exposed to the MCC. multiple range test used for comparison between groups. the footshock-treated group than the MCC-exposed group in the PFM and HTH. *Significantly different from quiet-controls (P < 0.05, **P < 0.01). +Significantly different from footshock-treated mice (P < 0.05, ++P < 0.01). Data are from the same experiment as in Fig Fig. 4-4.
treated mice was significantly greater than that of the MCC-exposed mice. mice (F2,2o = 8.8, P = 0.002). NAS (Fig 4-7). In this region, 5-HIAA was increased in the MCC-exposed mice. concentrations of 5-HIAA and the 5-HIAA:5-HT ratios in various brain regions. Significantly different from quiet-controls (P < 0.05, **P < 0.01). the two (F1,26 =4.3, P < 0.05) were observed for the mean time per contact (Fig. jig/kg clonidine 45 min before testing or 5 min prior to restraint. affect either compartment entries or rears. The effect of the al-agonist. phenyleDhrine (ICV). on behavior in the MCC. represent unrestrained mice. Solid bars represent restrained mice. **Significantly different from saline-controls (P < 0.01). the mean time per contact with the stimuli (F2,18 = 24.3, P < 0.001; Fig. 4-11). rears or compartment entries (Fig. 4-11). mechanism by which these treatments affected stimulus-directed behavior. did not inhibit locomotor activity. lesioned animals, an effect opposite to that we observed using DSP-4. post-lesion in the MCC, an increased mean time per contact was observed. to noradrenergic agonists as described above. regulation of exploratory behavior in the MCC. conducted between 08:30 and 16:00.
controls were excluded from further analysis. The effect of DSP-4 on the CRF-induced decrease in exploratory behavior. of compartment entries made in both the saline- and CRF-injected groups (Fig. 5-1) an effect not observed previously (see Fig 4-2). The effect of clonidine on the CRF-induced decrease in exploratory behavior. not significantly affect the mean time per contact in saline or CRF-injected mice. rears, or the number of contacts with the stimuli (Table 5-1). The effect of prazosin on the CRF-induced decrease in exploratory behavior. CRF 10 min prior to testing. 20 ng CRF. Testing was begun 10 min following the ICV injection. *Significantly different compared to saline-saline controls (P < 0.05). the number of contacts with the stimuli (Fig. 5-2). phenylephrine. The animals were tested 10 min following the second injection. tested 10 min following the second injection. in contrast to their effect on the restraint-induced decrease in this behavior. CRF suggests that CRF and NE do not act as two parallel systems. just as observed in otherwise untreated animals. stress also decreased the a-potentiation of P-stimulated cAMP accumulation. noradrenergic systems, stimulated by the stress of the surgery. release in both cannulated and uncannulated animals tested in the MCC. behavior in the MCC in cannulated and uncannulated animals is similar. noradrenergic function in stress (Valentino, personal communication). response paradigm (CER; Cole & Koob, 1988). hypothalamus or from other sites within the brain. al., 1982; Koob & Bloom, 1985; Rivier et al., 1986; Dunn & Berridge, 1987). release of CRF to influence behavior in this novel environment. and an increase in the concentration of plasma corticosterone are observed. decreased by clonidine and increased by yohimbine (Harris & Newman, 1987). punished responding in the Geller-Seifter conflict test (Kruse et al., 1981). paradigms involves the release of CRF. neurochemistry of stress and anxiety. 1987) and coryanthine, but not the P-antagonist, propranolol (Plotsky, 1987). and where CRF might act to affect exploratory behavior. responses, and whether they serve similar functions in stress remains unclear. through two different neurochemical mechanisms in these two paradigms.